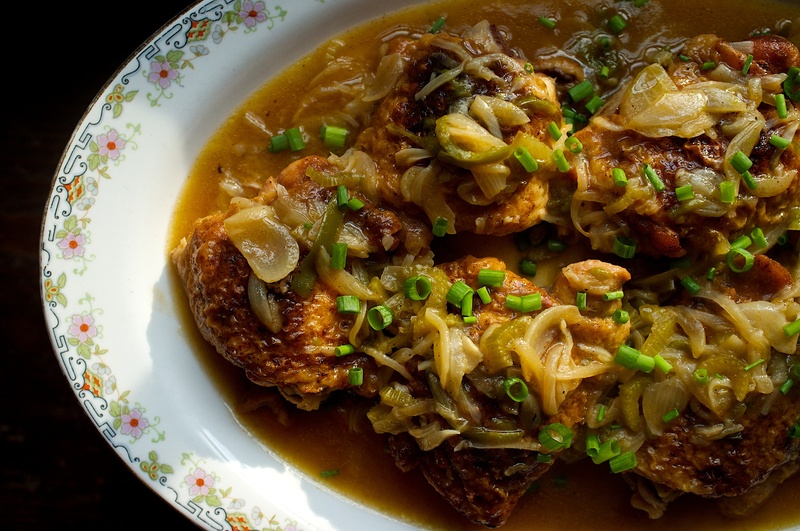 Smothered chicken makes for a comforting Sunday dinner. It’s the kind of dinner that will bring the kids back on Sundays after they have left home to be on their own. The combination of peppers, onions and celery (known as the trinity in cooking) is very warming and homey. It is a great dish to serve over boiled rice and if you were to serve green beans and biscuits with it you would, or at least I would, be in heaven. 1. Combine all the spice ingredients in a small bowl. Season the chicken thighs on all sides with salt and then with the spice mixture. You may or may not have extra spice depending on how heavy your hand is and whether or not you season 6 or 8 thighs. 2. Place a heavy, large sauté pan over medium high heat. Add enough oil to the pan to easily coat the bottom completely. When it is hot add the thighs skin side down and brown them deeply. Once they are brown do the same to the other side. 3. Remove the thighs to a plate. Add the onions, bell pepper and celery to the pan. Season them with salt and pepper. If the pan is to hot turn down the heat and cook down the vegetables until they are brown and soft. Add the flour and sauté everything for a bit longer to cook out the flour flavor. 4. Add the garlic cloves and give the veggies a stir. Add the chicken thighs back to the pan and add enough water to cover the thighs by three quarters. The crispy tops should just be peeking out of the gravy. Add all but a tablespoon of the green onions to the sauce. 5. When the gravy comes to a boil reduce the heat and simmer until the chicken is cooked through and tender, this should take about thirty minutes. Season the gravy, stir and taste. 6. If the gravy is reducing to fast and getting to thick add more water and stir. If you added more water bring the sauce to a boil and serve.